Early Childhood Education Center. Fayetteville Metropolitan Housing Authority. Fayetteville, NC. The Early Childhood Education Center is the result of a joint effort between the Fayetteville Metropolitan Housing Authority, the City of Fayetteville, the Cumberland County Action Program, Inc. and head start. The team wanted a modern facility to serve the surrounding community. 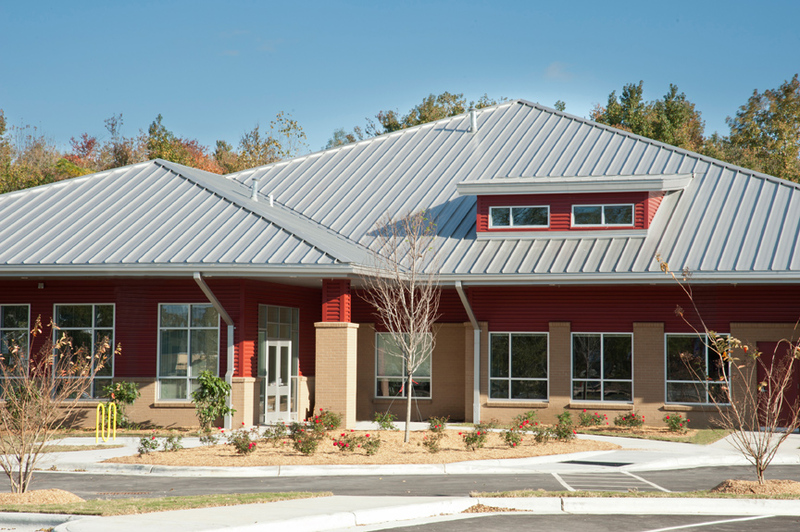 The design incorporates general classroom spaces to accommodate approximately 70 children. Future expansion considerations were made early in design, which will allow the building to grow to accommodate up to 100 children. Spaces within the building include classrooms to serve infants thru pre-school aged children. Adjacent to the classrooms, food prep areas, diaper changing stations and shared child size toilet facilities were provided making the environment teach friendly. A commercial kitchen including commercial grade equipment was included in the design. Natural day-lighting was considered and brought into the spaces with large windows and dormers with clerestory windows. Large overhangs provide shading to prevent sun glare and exterior spaces for built-in picnic areas. Exterior site amenities include playgrounds that were also part of the project design. The playgrounds include designated fenced in, age appropriate areas complete with playground equipment and poured playground surfacing. Shade structures were incorporated to provide shading and protect from the sun.